Well, we had no RV (I have to say, I missed making leprechaun jokes, but maybe that is just me), we had no Stew and we had no two strokes, but somehow the Supercross circus went on without a hitch. For those concerned that something would be lost, take a page from Aaron Rogers and just relax. The sport went on without Hannah, it went on without Johnson, it went on without McGrath and Carmichael, and now it will go one without the angry Lilliputian (there, I did it… That feels better). 1St Place: Kenny “My English Is Better Than Yours” Roczen – Well, well, well here we are again. Another opener and another blitzkrieg of the SoCal “brah” set by the ever-likable German. The win is not particularly surprising, considering Kenny won the opener last year and then proceeded to take his Katoom to the 450 National title outdoors. There has been some nattering in the pits about the switch to Suzuki, but the RM-Z is a proven (it ought to be, they have been racing the same bike since 2008) bike and it is pretty clear the Teutonic Terror knows how to twist the loud handle. The question will be, can he prevent the big mid-season fade that has plagued him the last few years. Time will tell. 2nd Place: Jason “Real Men Do It Un-tucked” Anderson – Holy Hooska Batman! I have not seen a Husky go that fast since I sat on my remote while watching On Any Sunday and send Malcolm Smith hurtling across the desert at 3x speed. I have to admit; I totally did not see this one coming. Yes, Jason is a 250 SX champ, but the same could be said of about 50 kids going back to 1986 that never did diddly squat on the big bikes. He was wayyyyyy off the pace most of last summer and I had doubts coming in as to whether there was too much hype about the kid. Well, it appears I have to eat a flat-bill and just shut up, because he showed me. All the talk about the “unproven” Husky was BS too, because it is basically just a Factory KTM, but it was still cool to see such a historic brand back in the limelight. I love the look of the new bikes and prefer it 1000% to the black-bart looking bikes they ran last season. Congrats to Sweden on this glorious outcome, they may have lost Saab, but they have gained Jason Anderson. 3rd Place: Trey “I’m Pretty Fly® For A White Guy” Canard – Trey was my pick (and a lot of people’s I’m sure) for the win. He was coming off an amazing end to the outdoors and was by far the fastest guy at the Monster Cup. Of course Zee German was not there, but that doesn’t take away from the speed she showed in Vegas. I still think if he had got a better start he could have won last night, but the wily Deutschländer hit the Jimmy John’s boosters off the start and checked out. Still, third is a solid start to the season and if Trey can keep the Honda off the deck, I think he will be a legitimate threat for the title. 4th Place: Ryan “It Appears Drafting Does Not Work In Motocross” Dungey – Remember “Angry Dunge”? The guy who would put it in there and punt anyone foolish enough to venture in his path? That guy was fun to watch, but less effective in the “ I need points to win the title department”. He was flashy, but prone to yard sales and just not who this guy is (Jake Weimer might disagree, but that is a discussion for another day). This Dungey tics off the laps and waits for others to crash or get tired. If he could actually get a start every week that might work out well, but if you are going to start sixth or seventh every week, you are going to need some help to win this thing. In the end, I have no doubt he will be in the mix for the title, but I do think he is going to need more than one win this year if he is going to score his second Supercross crown. 5th Place: Andrew “If I Was Any Nicer I Would Be A Puppy” Short – Sweet jiminy Christmas I was pumped for Andrew last night. His win in the first heat was by far my highlight of the whole evening and I was so excited to see him fight off Roczen for the win. Even after that, I held no real allusions about his ability to score a top five, but damn son! You showed me something in the main holding onto the front-runners for so long. It appears the Fountain of Youth is actually in Texas, not Florida. For Short to be so competitive, for so long is just a testament to his work ethic and commitment to racing. No one would ever accuse him of having 1/50th of James Stewart’s talent, but he has heart in spades and that is something that can’t be measured on a lap time chart. Plus his Fly gear was bitchin last night, so there is that. 7th Place: Weston “Tiny” Peick – Good ride last night for the escapee from Privateer Island. I actually saw him attempt a scrub at least twice, and while it looked slightly awkward, it got the job done. This guy reminds me of a grizzly bear on a mini bike out there and he could probably flatten a triple if he cased it hard enough. A 7th is a good finish for Weston and I would think JGR would be happy with this result. I think he could sneak in and get a fifth, but a podium finish would need to wait until the herd is thinned quite a bit. Solid ride by a rock solid guy. 8th Place: Broc “It Is Good To Be Back” Tickle – This is a solid ride by a guy coming off what could have been a career threatening injury. I am glad RCH stood by Broc and gave him back his ride this year. I think he could be contending for top fives again and I’m sure Mike Alessi is happy to have his favorite berm back for another year. 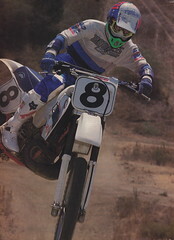 9th Mike “I Appear To Have Lost A Rotor” Alessi – OK, tell me for one moment you were not hoping for another cry-gate. Last year, “The Hype” got the year kicked off with an epic heat race win and an even more epic podium breakdown. It was great entertainment and I think The Universe was pleased. This year, Mike was quietly competitive and mostly off the radar, with the exception of his going full dirt track and eschewing a rear brake at one point. Apparently someone at the hot tub factory forgot about the whole righty-tighty, lefty-loosey thing. Going forward, a 9th is a good finish for the Motoconcepts team overall and if he can keep it in the top ten all year, even Tony should be pleased. 10th Place: Chad “Pink Is The New Black” Reed – Well damn, this in not what I had hoped for. I love Chad Reed, I bleed blue, yellow, green, red, green again…oh never mind. I root for him and live and die by the crests and valleys of his success. Last year, I almost had an aneurism when he won Anaheim and I nearly hung myself when he plowed into that San Diego whoop. He is the one guy I root for most, but even I have my doubts about how this year will go. I am not ready to throw in the towel after one round, but the outdoors, MXoN and Monster Cup did not leave me with a warm and fuzzy coming into 2015. Hopefully he will get the kinks worked out and prove all the doubters wrong one more time. I’m pulling for you Sir Speedy.